about this book: Twin reapers were chosen by the Gods as protectors of their world and blessed with sacred magic. But will it be enough? The world of Nirus is entering a time of discord. The war between the realms is threatening the fragile balance of this world. Even the Demon kingdoms are fighting among themselves. Caught in the middle are twin reapers who may have a bigger part in this dark adventure than ever imagined. After six years trapped inside his twin, Xavier's soul is finally back in his own body, although his long years in a soul-less coma has left him physically weak. Death Princess Willow is thrilled to have her fiancé back, but her duties as Grim's emissary takes precedence now that the Reaper's war with Everland has intensified. The twins sail with Willow and their loyal band of followers on a diplomatic mission to the icy glaciers of the Ocean realm. It's here in this magnificent palace that the brothers discover the secret powers of the Ocean relic, the Pearl of Emerald. When the Ocean king denies them aid, they must sail on to the lush forests of the Neverland continent to seek troops for their war. But the ruthless new queen has laid an ominous trap for the legendary Shadowbloods, and the reapers are sailing right into it. 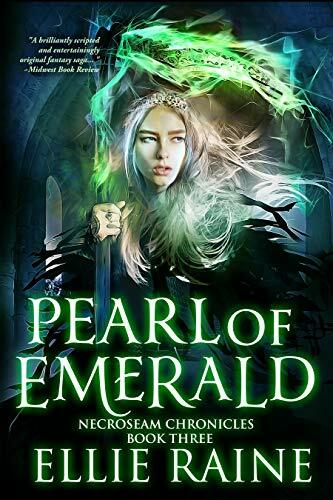 Pearl of Emerald is the third installment in the NecroSeam Chronicles, an original "scythe and sorcery" hard epic fantasy saga set in an alternate world like no other. This is a totally different take on dark fantasy, where "Reapers of Death" are honorable knights sworn to protect souls and kill demons... the classic lore of the Grim Reaper braided into a thrilling adventure full of whimsy, wonder, and just a dash of horror.